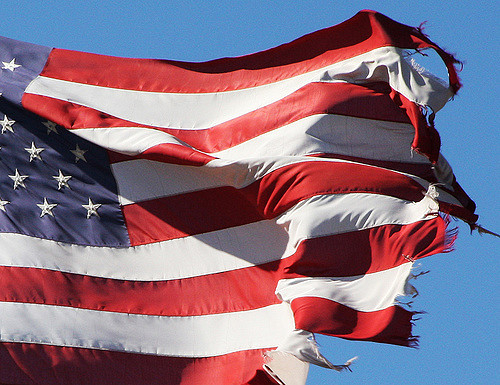 Flag Retirement is the term used to define the proper, dignified way of destroying United States flags that are no longer fit to serve the nation. When Should You Retire Your American Flag? It's up to you. Most people retire their flag once it has become tattered or faded. Keep in mind that you are able to wash and repair your flag to help extend its life. We recommend using a mild detergent on a gentle cycle with cold water. Learn more about how to properly care for your American flag here. Who Can Retire the American Flag? Anyone. The U.S. Flag Code does not specify any one person or organization that is authorized for retiring American Flags. An official flag retirement ceremony is not required however the disposal should be private, dignified, and solemn. How Do You Retire the American Flag Properly? The preferred, and often considered the most dignified, way to retire an American flag is to burn it. As stated above, the action of doing so must be dignified and the flag must be completely burned to ashes. 1. Contact your local Veterans of Foreign Wars (VFW) post, Elks Lodge, American Legion post or similar group. These organizations are often familiar with flag retirement protocol and will take your flag and ensure that it is disposed of properly. 2. Recycle your American Flag. There are companies found on the internet that will accept and recycle, usually for a small fee or donation. Be sure to do your research ahead of time to ensure you're working with a respectable organization. 3. Send to the Stars for our Troops program. The Stars for our Troops program takes your old, tattered and worn out American Flags and turns them into a prized possession for an American Soldier at home, on base or overseas. Volunteers lovingly cut each embroidered star from the flag, dispose of the stripes properly, and place each star into a tiny plastic bag with a card. "I am part of our American flag that has flown over the U.S.A. I can no longer fly. The sun and winds have caused me to become tattered and torn. Please carry me as a reminder that you are not forgotten"
The program does not accept printed flags, only embroidered, and the flags must be Made in the USA. Stars for Our Troops, Inc. Looking for Other Resources About Proper Flag Etiquette? Be sure to check out the following pages for more details about how to display your flag properly! How to Display an American Flag Outdoors: Learn about the proper ways to fly your flag outside of your home or business. How to Display an American Flag Indoors & With Other Flags: Find out how to use proper etiquette to display the American flag indoors and alongside other flags. Half Staff Dates & Flag Display Rules: Review the official half staff calendar and find out how to correctly display your flags on the designated half staff days. Have Questions About Flag Etiquette? Ask Our Experts! If you have additional questions about how to properly display or dispose of your American flag, don't hesitate to reach out to us! We're passionate about all things flag and can help you make sure you're flying your flag proudly and properly! Give us a call at 1-888-697-3524 with questions, or contact us online to get in touch with one of our flag experts!